Juangfraujcoh an eternal place of dazzling snow in the Alps, Switzerland. The atmosphere is cold and white, will be an unforgettable experience. Come Play in the snow there. If you have seen the Alps and snow that enveloped on television, then Juangfraujcoh will provide a more complete picture. Place such as painting, which is difficult to express in words. When traveling to Switzerland, do not miss to visit this place. Jungfraujoch is the Alpine permafrost terrain basin flanked by two mountain peaks, the Jungfrau peak with a height of 4158 meters above sea level and Moench, 4170 masl. This place was situated at an altitude of 3454 masl. Trip to the Jungfraujoch can dilalu with electric trains, the Jungfraubahn. The train is passing as far as 7 km, and pass through Interlaken, Lauterbrunnen and the surrounding through the Eiger to the Jungfraujoch peak. Do not close your eyes when you ride this train, because the scenery was beautiful. Prices for electric train is about 120 Euro. Arriving at the Jungfraujoch, the cold white snow nan will look as far as the eye could see. You can see the snow covered mountains as the Alps Eiger and the mainland. 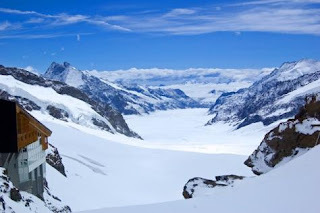 One of the favorite places on the Jungfraujoch is the ice palace. Here you can see the various types of carvings made ​​of ice. It's interesting. Great time to visit this place is now in April and May. At that time the snow conditions are not dangerous, and the tourists can try skiing and snowboarding. Experience that would be difficult to obtain. Some hotels, restaurants, and souvenir shops on the Jungfraujoch will make you feel more comfortable journey. Do not forget to use a thick jacket and note the continued warnings from security officers. 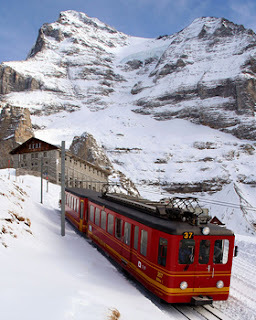 Welcome to visit Jungfraujoch and feel the sensation of eternal snow.